Fragrance is filled with mystery. It’s one of the few beauty products that’s surrounded by long-time myths that can’t seem to be shaken. We’re on a mission to debunk the myths and bring you the facts. After all – a fragrance is an investment, so you should be getting the most out of yours. Myth: Fragrance should be tested on a test card. Truth: They’re super handy when you’re testing out a whole lot of scents, but a test card can be misleading. Fragrances smell slightly different on each person, as the ingredients react with skin. That’s why a scent might smell amazing on your BFF, but doesn’t work on you. Always test a fragrance on your skin before handing over the cash. Myth: Perfume is best worn on the nape of the neck. Truth: Major wakeup call beauties – the alcohol in perfume causes the skin to be more sensitive to the sun. If you’re not taking proper precaution with a broad-spectrum SPF, you may develop pigmented spots on the areas where you spray your perfume. We recommend spraying on your wrists, back of the knees and chest instead of exposed areas like the neck. Myth: Spray fragrance on your hair for an all-day scent. Truth: The alcohol in perfume can have a major drying effect on your hair, so if you’re prone to dehydration, breakage or split ends, we wouldn’t recommend it. Myth: The pricier the scent, the better the quality. 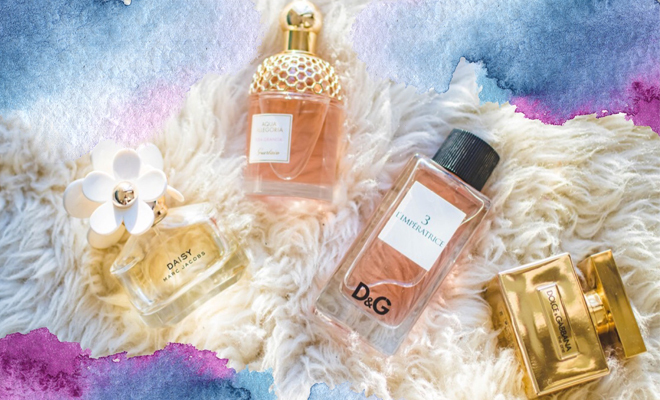 Truth: There’s no denying that a luxurious scent usually comes with a serious price tag. But the price isn’t always an indicator of quality. Some perfumes are pricey because they’re produced by a premium brand that has to pay major marketing costs or celebrity endorsements. Comparison is your best friend – test as much as you can and you may be surprised at how long a more affordable scent lasts. Truth: You may not see an expiry date on the box, but perfumes aren’t meant to last forever. Fragrances are sensitive to light, humidity and heat. The better you store them, the longer they’ll last, but over time you may notice a change in scent, as well as darkening of the fluid. Myth: Rub your wrists together to distribute the fragrance equally. Truth: Whatever you do, do not fall for this old school trick! Rubbing the fragrance will crush its molecular structure, changing the way it smells on you. Fancy yourself a bit of a fragrance fundi? Comment below with your best tips on making the most of your favourite scent. Very interesting facts in this article…will definitely share. Honestly love this informative article! I was shocked to find out that most of the myths mentioned are still used by so many people. Will definitely be sharing this article and its great tips.